Raleigh — The start of the new year means making New Year’s resolutions. And financial experts believe it’s also the perfect time to get financially fit. Spectrum News Anchor Caroline Blair goes In Depth with Rick Gardner, a financial planner and founder of RGA Investments, on some ways we can all keep our finances in check for the future. The end of the year is a key time to review your financial “health” and well-being. If you feel you need to address any of the items above, please feel free to give us a call. 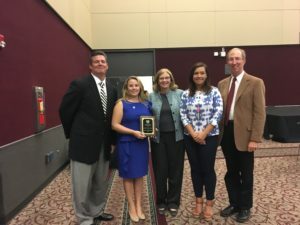 Last week, I was honored to attend a banquet with Children’s Flight of Hope where the Raleigh Mayor’s Committee for Persons with Disabilities recognized the organization for Excellence in Transportation. This award recognizes organizations that contribute significantly to the quality of life of people with disabilities through creating expanded access to transportation in Raleigh – and I can think of no organization that does this more consistently than Children’s Flight of Hope. Children’s Flight of Hope provides air transportation for children to access specialized medical care. These children have physical and/or developmental disabilities that are caused by a variety of medical diagnoses and need medical care that is not provided in their home area, but their families do not have the financial resources to travel to the necessary care. So far in 2017, CFOH has provided more than 600 flights to 183 children worldwide. The Mayor’s Committee for Persons with Disabilities helps people with disabilities participate in the economic and social life of the community. How far would you travel to heal a sick child? If you’re a parent, the answer is a no-brainer. As a parent of 3 children of my own, there’s nothing that would stop me from trying to see my child healthy again. But the truth is, a child’s road to recovery isn’t always simple. For some families, a child’s illness is so specialized that parents are limited in how much they can actually help. That’s where Children’s Flight of Hope (CFOH) steps in. For more than 25 years, CFOH has been flying children commercially, privately and internationally, to find the right medical care for those that need it most. But CFOH is more than just an air taxi service, and that’s why I’m honored to serve as the organization’s board chairman. Each child that flies with CFOH becomes a CFOH child for life, and that’s because we care deeply about their path to wellness. Providing transportation is great, but offering hope to families in the midst of the most difficult season of life, is what it’s really all about. It’s easier than you think. While CFOH flies children internationally for specialized medical care, the organization itself is based here in the Triangle, making it easier for you to get plugged in and support the cause. $20 – Covers the cost of an aviation bear. $25 – Underwrites a small, fleece blanket for travel. $75 – Fully-stocks a backpack care package. $100 – Trains a flight liaison for children who require private travel. $500 – Covers the cost of an average commercial mission for a child and their companion. $5,000 – Covers CFOH’s cost for private travel missions. Remember, the backpacks aren’t your only option. Fortunately, the Triangle community has embraced CFOH and its mission, by supporting multiple events throughout the year to help give back to children in need. Over the next few months, you’ll have the chance to join us at either of the events below. We’d be happy to see you there. Hops for Hope – Sept. 23, 2017 at Morgan Street Food Hall. A Vintage Affair – Oct. 20, 2017 at the Pavilion at the Angus Barn. When I joined the board in 2012 we flew 69 missions, mainly up and down the East Coast of the US. Yet, in just a few short years, with the help of some outstanding people, CFOH finished out 2016 with 510 flights serving children around the world. With your help, we can do more. Let’s see how many children we can support, and what more can be accomplished in 2017. Download your weekly update here. Six questions to contemplate before the transition. Should you take in a renter? Let’s say you love your home and you are thinking about deriving more income from it. You could optionally rent a room, a furnished basement or a guest house to … your kids, or a graduate student, or a senior living alone. Income aside, do you have a mom or dad who requires help with everyday living? It may be emotionally and even financially appropriate for that parent to move in with you. Rick Gardner may be reached at 919-881-1641, or contact us here.